The day after Thanksgiving, Jacob went into the St. Cloud Surgical Center to have his tonsils and adenoids removed, as well as his sinuses tidied up. In true Jacob-style, he handled it like a champ! We explained everything before it happened. He didn't once complain about fasting before the procedures. He took the medicine before-hand without a fuss and even walked into the OR and climbed on the table himself. When we brought him home, he ate and drank without an issue. I was wondering if he would have any pain the way he was playing. Fast forward a few days. Jacob is healing well. He sleeps great at night, plays during the day and rarely complains about his pain. I'm so impressed with how well he's doing. I haven't brought him to daycare or preschool yet. Maybe he would do just fine, but I want to make sure he's ready for the rough play. The only thing that he really doesn't like is medicine time. They gave him liquid Vicodin and apparently it doesn't taste good. This time at home has given me the opportunity to play more with him. Grandpa Sam and Grandma Ann bought him Candy Land to help him recover. We've played that a few times. It's hard to lose, but I refuse to let him cheat and win. Kids need to know how to be a good winner and loser. Grandma Sarah and Grandpa Doug bought him a Thomas the Train magazine that we've been working on. There are tons of activities like counting the engines and tracing numbers. I'm impressed with his level of concentration. Krista and Abe bought Jacob some jingle bells; so that he doesn't have to strain his voice during recovery. He thinks is a pretty cool gift. The other day, I tried to take a nap. The bells were rung right away. I think the mother-lode came from Becca and Josh. They bought Jake new pajamas (which he has hardly removed since Friday), chap stick (lipstick), and several new toys. The paddle ball game, squishy caterpillar and Color Magic paper have been some favorites. I feel blessed that the surgeon preformed the procedures well and without complications; and I feel blessed that our family and friends have been so supportive. But mostly, I feel so blessed that Jacob is recovering so well. The clock has been reset again. My parents asked if I could help them re-shingle the roof of the cabin this weekend, and because Andrea had a wedding rehearsal Friday and a wedding Saturday, she stayed home and I took the boys up north. Jacob coughed a bit on the way up, but not too bad. When we got up to the cabin, he started coughing worse, breathing harder, and generally seemed to be in worsening condition (though his attitude was stellar). 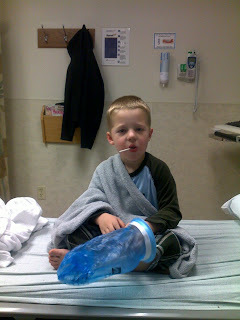 Andrea came up post-haste, and we ended up taking him to the emergency room in Brainerd right around midnight. This kid is one hell of a trooper. Despite having a very hard time breathing, he was happy as a clam. He was only disappointed when he found out that he couldn't go back to the cabin and had to stay overnight in the pediatric unit. That didn't last long, though, as he got some Legos to play with as well as a whale beanie baby. Vomit bags are actually a good thing. They're quite fun to play with. The tests for RSV, the flu and ear infection all came back negative. X-rays looked good. The doctors thought the symptoms seemed asthmatic. Jacob is already on the path to getting his tonsils and adenoids out (hopefully by the end of the year). Now we've got to take him in and see if he has asthma. In the meantime, he's back on a nebulizer and is taking some nasty medicine (I tasted it, and yes, it is as disgusting as he said it is). But he's taking it like a champ.